Protect your joints using proper form for joint replacement exercises. Joint replacements may be more commonplace as we age, but we can take steps to prevent or prolong it. Get back in the Swing! 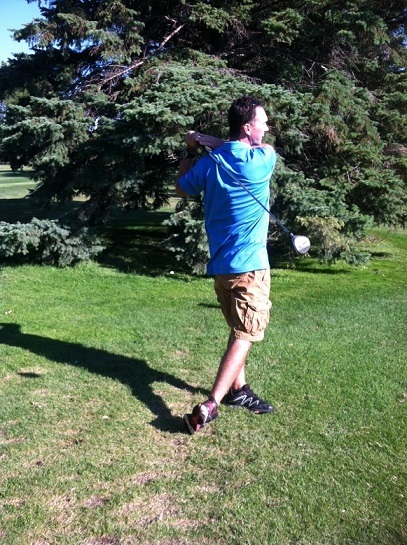 Good form can get you back in the swing of golf and life! Not only are joints healthier and aligned, but you don't hurt. Researchers say the results indicate that even modest weight loss may significantly lighten the load on your joints. "The accumulated reduction in knee load for a 1-pound loss in weight would be more than 4,800 pounds per mile walked," writes researcher Stephen P. Messier, PhD, of Wake Forest University in the July issue of Arthritis & Rheumatism. "For people losing 10 pounds, each knee would be subjected to 48,000 pounds less in compressive load per mile walked." Besides weight related joint stress another main reason for a joint replacement is overuse or repetitive stress on the joint caused by poor posture or body mechanics. Specifically, for the knees and hips, lack of flexibility and strength in the muscles surrounding the joints creates more tension and stress in the joint when moving, especially when we sit and stand. The consequence of this is pain and limited mobility. Because we have to sit and stand, get up and down out of chairs, cars, etc. many times daily this can cause a great deal of stress on the hip and knee joints. Proper form and alignment while doing joint replacement exercises and just during daily activities is essential. - When squatting or sitting make sure the movement comes from a flex at the hip and ankle, not just by bending the knees, (this should automatically happen). Poke your bottom out behind you, keep your chest high, and keep your knees aligned over your first two toes. - This is a great exercise to practice daily. Move slowly and try 10-15 repetitions a couple times each day. It helps to strengthen the feet and ankles, hips, and big groups of quads and hamstrings that support the knees. - You should not have joint pain in the kneecap when performing this exercise. A daily exercise routine should include stretches and exercises that target the feet, upper and lower leg, hips, back, and shoulders. The exercises will help increase your joint range of motion and help to reduce wear and tear on the cartilage including nourishing the cartilage through the movement. 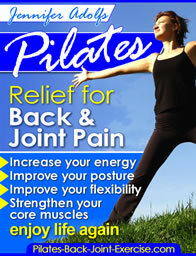 Pilates exercises are an excellent way to both improve flexibility and strength around joints. The resistance springs used on the equipment are perfect for stretching and creating space in the vertebra and joints, while simultaneously strengthening the muscles surrounding the joint. I encourage my Pilates students to do these stretches and exercises daily and before each workout just to properly align the body before exercising to avoid injuring the joints. 1. 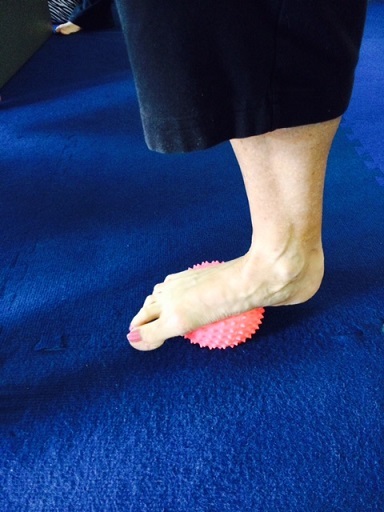 Rolling your feet over a golf ball or similar will help to release fascia and tightness that may lead to poor posture up through the knees, hips, and rest of the body. 2. Stretching your calves and lower leg muscles helps keep the ankles and knees aligned. 3. Stretching tight hamstrings and quadriceps of the upper leg can help keep the knees and hips aligned properly for better body mechanics and less pain. 4. Stretching the muscles of the hips in all 4 directions can help to keep the pelvis and hips healthy and aligned. 5. Just remember, if you are going to stretch and strengthen a muscle group on one side of the body you need to balance it out by doing the same to the opposing muscle group otherwise you end up with imbalances in the joint alignment. Even though you may not feel like moving when your joints hurt, remember that joint replacement exercises enhance movement, and is like a lubricant to your joints nourishing the cartilage, thus, increasing the health of the joint.